This stage has no heart runes drop!!! After enemy's first attack, enemy convert a random row to Light; After enemy's second attack, enemy convert a random column to Light; This effect runs as a cycle. When enemy attacks, 25% of summoner's HP will be deducted. The more the enemy attacks, the higher the deduction percentage. Enemy weather a random rune during rune spinning. When weathered rune is touched, rune spinning stops immediately and 3000 HP will be deducted. Summoner need to dissolve Water, Fire, Earth, Light and Dark runes to inflict damage to enemy. Summoner's HP become 1 and all Heart runes are converted to Dark upon entry. Enemy attacks twice in a turn. The lower the enemy's HP, the more times it attacks in a turn. After enemy's first attack, enemy convert a random rune type to Fire; After enemy's second attack, enemy convert a random rune type to Dark; This process runs as a cycle. After enemy's first attack, enemy convert a random row to Fire; After enemy's second attack, enemy convert a random column to Fire; This effect runs as a cycle. Enemy ignores damage reduction and tumbler. Enemy is immune to all control skills. Attack of enemy's attribute is reduced by 90%. Enemy masks 6 runes upon entry. After enemy attacks, 2 runes will be masked. Enemy reduces rune spinning time by 2 seconds for 5 turns. Enemy ignore damage reduction and tumbler. Enemy attacks twice in a turn. When enemy attacks, 70% of summoner's HP will be deducted. For every Heart rune dissolved, 5% of enemy's HP will be deducted. Enemy is immune to other attacks. Enemy removes all effects in play and reset CD of corresponding active upon entry. Enemy weathers 2 runes per turn. When weathered rune is touched, rune spinning stops immediately and 3000 HP will be deducted. The lower the enemy's HP, the higher its ATK, to the max of 20x. When enemy's HP is below 30%, enemy attacks twice in a turn. Enemy locks all Earth members' active upon entry. For every Earth member in the team, enemy's ATK + 40%, to the max of +200%. Summoner need to dissolve 9 or more combos to inflict damage to enemy. Else, enemy attacks for (9-N) times. Enemy burns 10 runes along the 2 diagonals. Every time burning rune is touched, 10% of summoner's HP will be deducted. Team consists of 3 or more Gods. Charging Condition: Dissolve Fire Runes. Skill I: For 1 turn, team ATK + 15%. Skill II: For 1 turn, team ATK + 15%. All members ignore attribute relation. Skill III: For 1 turn, heal 50% of team HP. Can't you just burst your way through that stage? It depends on the order of reduction. If 10% reduction comes first, you won't die. Yes and/or use Nidhogg to heal. It's pretty safe, apart from stalling on Rd 1 and the 9 combo shield. The HP reduction happens at the END of a turn. So after killing the first phase, you'll get 10% reduction, then get hp reduced to 1. Not dead. 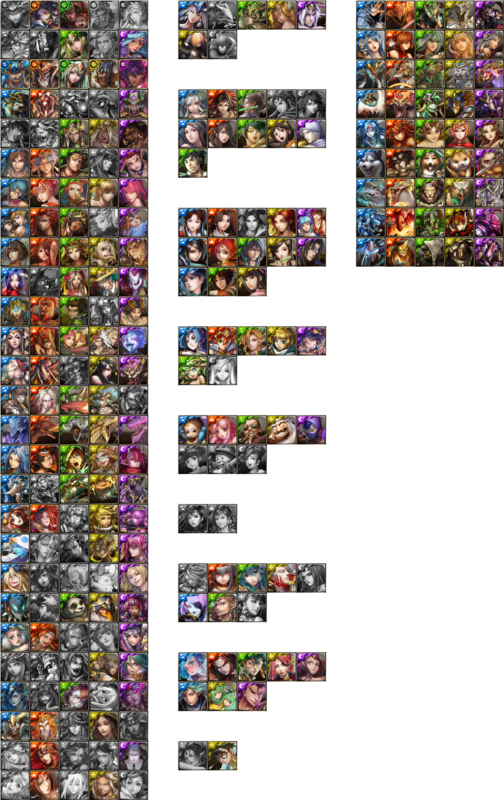 Available : LHY, Beelzebub, Abadon, PR Barbara, ALL MAX Apollo, etc. (06-10-2016, 08:03 PM)Arigato Wrote: It depends on the order of reduction. If 10% reduction comes first, you won't die. You lose the 10% at the end of your turn before the start of the next. So you'll lose 10% and then when you enter the stage your HP will be reduced to 1.